The French u is one of the most difficult sounds for English speakers, and as an added bonus, can be difficult to distinguish from ou. The letter combination ou, IPA [u], is the easier of the two sounds. 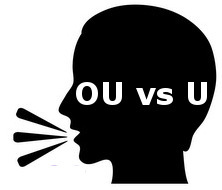 It’s similar to the ou in "you" except it does not diphthong into [w] at the end – learn more. The letter u in French, IPA [y], is much more difficult, largely because there is no similar sound in English. Again, "ou" is the closest, but u is very distinct – at least to French ears. U is pronounced with protruding, tightly pursed lips – learn more. To help you distinguish between these two sounds, I’ve collected an assortment of minimal pairs: words that are pronounced exactly the same other than the vowel. There are also homophones (words that are pronounced identically) listed underneath.